FOX GLACIER OR FRANZ JOSEF GLACIER? 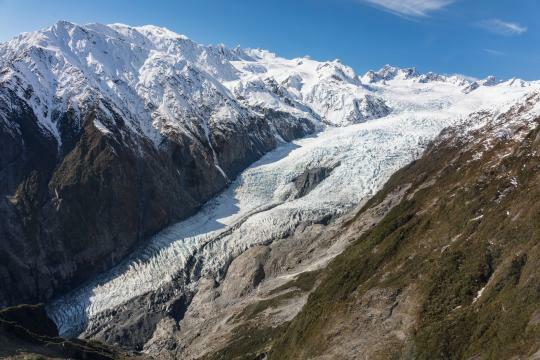 If you're wondering what the differences are between Fox and Franz Josef Glaciers, here are some key factors to consider. The West Coast of New Zealand is renowned for three things: the phenomenal amount of rainfall Westland receives every year, the region’s jaw-dropping beauty, and its fascinating and accessible glaciers. Two glaciers, in particular, Franz Josef and Fox, are unique in that each glacier’s terminal face is quite low in altitude in comparison to other glaciers at similar latitudes around the world. Franz Josef Glacier Guides has exclusive guiding access to Franz Josef Glacier - the only operator certified to offer guiding experiences on this impressive glacier. However, there are also trips available on Fox Glacier, so if you only have time for one glacier experience - which do you choose? We've outlined some key considerations to help with your decision. Fox has a more gradual incline, whereas Franz Josef drops more steeply from the Southern Alps to near sea-level. 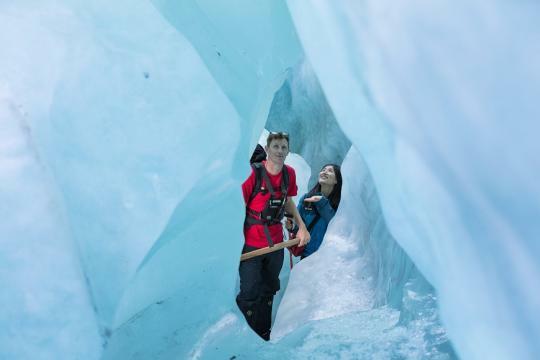 The steeper incline means that Franz Josef Glacier is constantly moving and changing, creating stunning ice formations such as crevasses and ice caves that accentuate the famous ‘blue ice’ visitor experience. Our guides craft their way through the terrain using their ice axe to find the most impressive glacier features and safest hike route. Franz Josef Glacier is located just a few km from the heart of Franz Josef township which offers a range of restaurants, cafes, bars and shops. There is an excellent array of accommodation options on offer ranging from campgrounds and backpacker hostels through to luxury hotels. 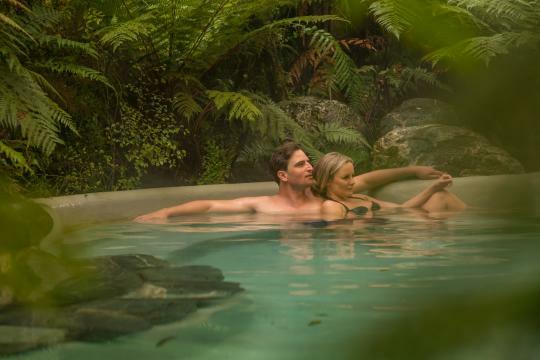 There is also a wide range of activities on offer within the township including kayak tours, scenic flights, pounamu carving and of course our relaxing Franz Josef Glacier Hot Pools. What better way to end a day of exploring the glacier than relaxing in the heavenly warmth of a hot pool? Only Franz Josef Glacier Guide trips include complimentary access to the Franz Josef Glacier Hot pools, located in the glacier base building in the heart of Franz Josef Glacier. Reflect on your day of adventure or unwind after a long drive with a soak in the hot pools, a rejuvenating massage or indulgent facial.